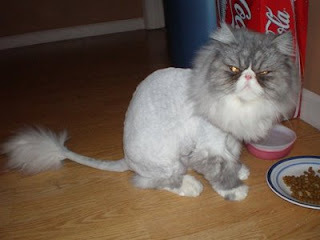 This pic is what Lester the Lion Kitty is SUPPOSED to look like, his lion cut is growing out but I'm going to have it re-done soon, I know y'all cannot wait. I was telling an old friend about OT work and I was like “I like working with kids under 1pm” ….I meant 1 year of age… 1pm makes sense though doesn't it. And then I was talking to her about her beautiful paintings and I said patients instead of paintings. Think OT is on my brain? Kind of a crappy day but could have been a lot worse….Had my 3 hours of sleep and then was frenzied worrying about agitated Lion Kitty plus had to gather a bunch of stuff at old clinic to take to new clinic at last minute…I almost cried when I got to the office and Linda the billing director/office manager chick lady helped me out, I swallowed my tears. She is awesome. She is my favorite person there and it's not mean to say that…I like everyone there, some I like more than others lol, but Linda is my Queen Bee. She's hilarious. She is having a little party on September 13th and it's going to turn into partially a going away party for me! Cuz they want to celebrate my departure, hahaha…just kidding. I hope. By the way I got Facebook messages from the COTA (assistant) and a PRN OT (works as needed) this weekend, I felt loved. ANYWAY….there was some chaos in the morning regarding commutes but it worked out, I drove me and my OT Christy and Speech Aide Haley to our first blind baby….she was in such a good mood and Christy had brought her one of her old walkers to use…the little girl just laughed and laughed….it was awesome. And I worked on keeping her head more in alignment, she tends to explore by raking her fingers on an object and throwing her head back and a low vision therapist pointed out that's not ideal…good point lol. Then lunch, we saw the mom of the kid we had just left! My coworkers had fried okra, turnip greens, creamed corn (a little country buffet place)….very Southern stuff. I was the weirdo eating tuna and lettuce I brought from home but money-wise and calorie-wise I needed to back off of eating out. Then an OT named Karen stopped by the clinic – my place works with two different OTs named Karen! Craziness. Three Karen's in their life now, sooo rare….I worked on paperwork for the plans of care from Friday while Christy and Haley did the home visit to our deaf/blind baby, they did it outside because the mom was outside with friends and the weather was nice. I love that you can do home visits outside on pretty days depending on the situation! Dodging butterflies…. Then I saw two kids at once after that- two little boys around 5 that are very similar in skill level and both need work on social skills, turn-taking, basic colors, counting, etc. And it went pretty smoothly….getting used to sessions with two kids. I had my laptop with me and had earlier pulled out a mixture of crazy songs like “Get on the bus” by the Doodlebops, plus calming Enya music etc. So near the end when speech therapist came in for co-treat we danced crazily then slowly, crazily then slowly, etc…I'm about to go see if I can find a clipping freeware program so I can do like 1 minute craziness, 30 seconds calmness, and make a CD or playlist of Crazy/calm….good to work on activity transition, state control, etc.. Drove about 140 miles today…that reminds me I have my low gas light on, better get gas in morning!! Blah blah blah, was going to go to Zumba or yoga with Allison but the rain hit sooooo hard that the roads were flooding and it was treacherous, I could barely see, I was rather frightened…when I hit my exit I was like…I've had 3 hours of sleep…my precious lil Lester may be dead…and the freeway/route I'd need to take to continue on to the gym, not to mention lack of umbrella, just wasn't worth it. Went straight home, sat in car for a long time waiting for rain to stop. I finally used my car shade protector to help me get inside, I was still a drowned rat. Lester was fine. I slept with him for a few hours, chatted with Allison about her day…and made a healthy dinner!!!!!! Yay!!! Grilled veggies, egg beaters, some farmstand potatoes with plain yogurt…oh the excruciating detail but you have to realize I lived on peanut butter crackers and Lean Cuisines for a long time, so I have to announce to the world my cooking. It's almost 11pm…gonna try and take a relaxation med and go to sleep….feels good to have the articles quasi-out of way…OT Practice editor will be getting back to me revision wise soon, and Kuma was fine with the diversity/disability rough draft I sent him…so gonna work more on that soon. Tomorrow we have meetings starting at 830am to work on schedule and First Steps etc (I've warned them that two-hole punchers with those measuring sticks freak me out and make no sense to me…I'll help with organization of the folders once somebody starts me off on the hole punching…lol I am horridly dumb at such things)..then have kids scheduled all afternoon. Get off at 7pm and plan to go to gym with Allison. The End.